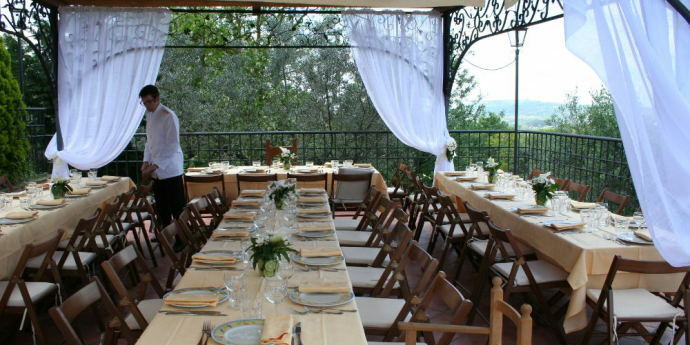 The farmhouse of Tenuta Merlano is an ideal location for Parties and Events in Rome’s countryside. The charm of the ancient farmhouses of Tenuta is perfectly in keeping with the furniture in country chic style. Celebrating the charm of a historic house, immersed in the scents and colors of nature, in the hills of the Roman countryside with views of Rome. In the main house of the farm you can book for your party or event exclusive reception room “Merlano Taverna” or the beautiful “Merlano Terrace” with their outdoor spaces. We can wear white if the farm is a wedding party or we can organize the spaces of our farm as best suited to your party and your guests and make you live unforgettable moments. We have a catering service and highly experienced professional with a wide selection of menus to suit every type of occasion. The farmhouse of Tenuta Merlano is only a few kilometers from Rome, in the Veio’s Park, between the Via Flaminia and the Via Cassia, about 500 meters from the medieval village of Sacrofano. In the farm there is a parking area large and protected. Contact us and come to visit the ancient farmhouses of our farm and discover the atmosphere and the welcome for the Guests. Do you have any questions? Contact us for further information. We are happy to offer you a custom quote. Come and visit the ancient farmhouses of Merlano Agritourism. Experience the ambience and the warm welcome for our guests.